At Millenia, we value beautiful outdoor space. In fact, we’re building the whole community so every home is less than a three-minute walk to a park. This sentiment inspired many of our developers to include outdoor space in your future home. The patios, balconies, rear yards, and courtyards of Element & Z at Millenia, Skylar at Millenia, Evo, Metro, Trio, Pulse, Alexan, and Boulevard (coming soon) plus the SoCal sun are a match made in heaven for a slice of DIY garden paradise. Check out these patio garden ideas to start building your at-home oasis! Imagine picking lettuce leaves for a fresh salad. Or harvesting a pinch of rosemary for that pasta you’re cooking. It’s possible from a patio vegetable garden! Garden Tip: Most vegetables need a minimum of six hours of sunlight a day for good growth, and herbs need lots as well. If your patio gets less sun, you may find your veggies grow a little smaller, and you might opt for flowers or decorative plants instead. Before choosing plants, observe your patio and how much sunlight it gets and when during the day. This leafy green grows best in cooler weather, but it can grow well in warmer climates if you start it off in January. Grow several basil plants, and you’ll be able to make your own pesto for fresh pasta and more. Basil grows quickly and plentifully in a high level of sunlight. The pretty purple, white, and pink blooms, along with the gorgeous scent, make lavender a great addition to an herb garden. Its drought tolerance is especially welcome in Southern California! Choose edible varieties, such as Munstead, so you can use your patio lavender in cooking. Easy, fast-growing, and with a long growing period in SoCal, lettuce is a great option for many reasons. Grow whatever varieties you enjoy, and toss fresh leaves into salads all summer long! Parsley is a must in your patio garden simply because it’s so useful in a wide range of dishes. A handful of chopped fresh parsley is the simplest way to elevate a green salad or pasta dish, and its fresh scent and taste is welcome almost anywhere. Peppers of all kinds—from bell to sweet to spicy—work well as potted plants. Provide them with plenty of sun and good drainage, and you can look forward to a great harvest! Strongly aromatic and flavorsome, rosemary is delicious added to a wide range of foods. 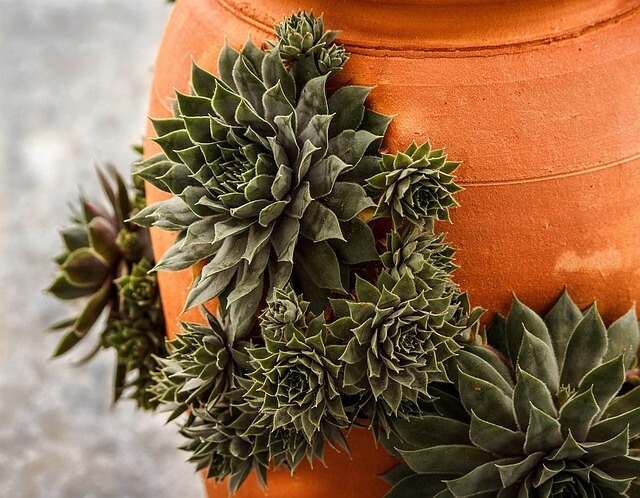 It’s hardy and drought-tolerant, and grows well in containers too. Sage is a good option if you’re also hoping to attract birds. 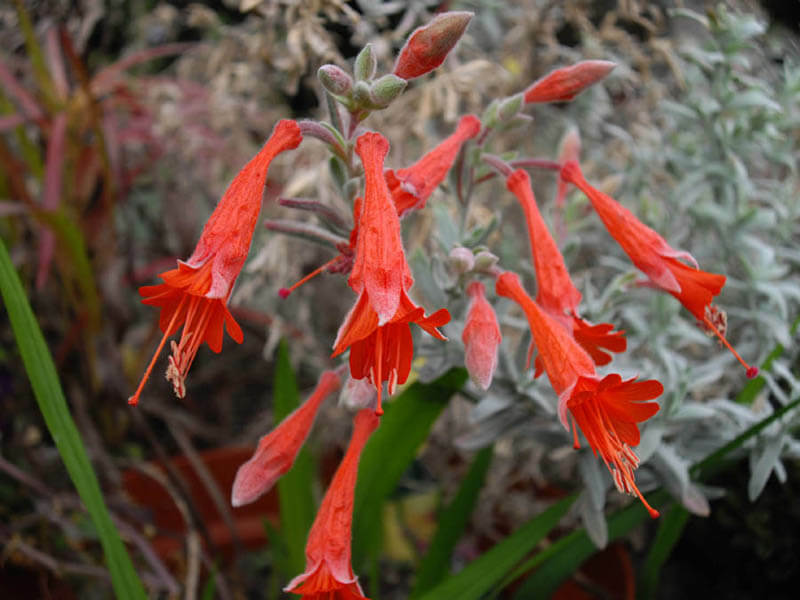 Most varieties of sage are highly attractive to hummingbirds. Salvia clevelandii, the Cleveland or Musk sage, has gorgeous, deep blue flowers and a strong scent. It brings beautiful birds flocking! Thyme is good on its own in a range of dishes, but it works together beautifully with rosemary. Thyme is hardy and drought-tolerant but, like most herbs, needs daily sun to thrive. Tomatoes can be grown successfully in containers, but they do need a lot of room. The largest varieties can grow as tall as 12 feet tall and 2 feet wide! Choose medium or dwarf varieties to maximize your patio garden space, and remember to give them plenty of sun. If you want a gorgeous patio garden that doesn’t require a lot of maintenance, these hardy perennials are perfect. They provide color and texture that add interest to your patio, without the need for lots of micro-managing. Plan your patio garden ideas around these beauties to turn your outdoor space into a feast for the eyes! The African iris grows well even in difficult conditions, so you can expect beauty from these delicate flowers even if your patio doesn’t catch the sun all day. With multitudes of small white flowers in the spring and summer, this one is perfect for brightening up a patio corner. The exotic bird of paradise needs full sun for the best results, but if you have the room and the growing conditions, this dramatic perennial is a must-have. The long flower spikes and large multi-colored blooms make it a great focal point for a patio garden. This low-lying succulent works well in containers provided it has good drainage. It comes in a very wide range of leaf colors and shapes, so there’s lots of scope to create interesting arrangements. It’s even possible to create wall-mounted living succulent arrangements that look fantastic on both interior and exterior walls. This pretty, well-known plant is known for its spikes of trumpet-shaped flowers. Dwarf varieties of Agapanthus are ideal for container gardening. They’re a great way to add height to a patio garden. And bring Agapanthus stems indoors for lovely flower arrangements. With its tooth-edged leaves and golden flowers, Shaw’s agave is another great option for a statement piece in a patio garden. In the right conditions, the plant can grow as high as 12 feet tall, but its hardiness and low-maintenance requirements mean it’s still ideal for containers. Living in a condo or apartment doesn’t mean you can’t get the benefits of a backyard! Enjoy visits from birds and butterflies by developing a bird- and butterfly-friendly patio garden. Hummingbirds are especially fun visitors, and they don’t just love hanging feeders. Your patio garden flowers are likely to attract them too. For best results, use native plants, as these serve as food sources for the animals you’re hoping to attract. The hot-pink blooms of the fuchsia are a stunning addition to any patio garden, as are the birds and butterflies they attract. The drooping arrangement of the stems and blooms are stunning in hanging planters. Along with taller plants like the kangaroo paw, hanging containers are a good way to create vertical arrangements that help your patio feel more expansive. This tall, tree-like shrub can reach five feet in height! With its deep, red-brown flower clusters, it’s a dramatic plant that makes a great statement piece in a patio garden. It needs full sun, and it’s a hit with hummingbirds. Lemongrass grows as a large, deep-green bush. It both looks and smells great, but it’s useful too! Plant it as a natural insect repellent. The natural oil in lemongrass—citronella—is an effective repellent that keeps mosquitoes and many other flying insects at bay. This hardy, vigorous daisy produces clusters of pretty pale pink and purple flowers. Their blooms attract birds and butterflies and are easily cut for indoor arrangements. Also known as statice, sea lavender is a perfect low-maintenance perennial, with its vibrant color and very low water requirement. The stems are great for dried arrangements, and the colorful flowers attract birds too. A DIY garden takes a little effort, but creating a patio garden takes less and provides just as much joy! With these patio garden ideas, you’ll soon have a pleasant and pretty space that’s perfect for relaxing, for quiet al fresco meals, for summer parties, and for just plain enjoying!